On the way downtown, I pass this lovely New England home in traditional colors with a walkway lined with red geraniums. Handsome isn’t it? How would you like that first floor glassed in porch over on the right? I think I could learn to love it. Now, check out the open windows. You wouldn’t believe how many native New Englanders don’t use air conditioners of any type. I have friends and neighbors who just sweat it out. Linked to Norm Frampton’s, Thursday Doors, September 1, 2016. This entry was posted in Photography, Thursday Doors and tagged Colonial homes, New England, New Hampshire, Photography, Thursday Doors. Bookmark the permalink. I could get used to that porch for sure. What a lovely home. You certainly have a sweet ride when you leave your house, Judy. We built a screen porch. Then, a year later, we added AC – ac’s better 🙂 We might be wimps, but between the heat and humidity and my wife’s allergy, cool and filtered seems to work. That’s quite a house! I’m intrigued by what looks like a small balcony over the front door . . . but you’d have to climb out the window to get to it? What a lovely home this is, and yes, set me up with a good book in a comfy chair on that porch and I will be there for quite a while. I’d love the porch, especially if there are screens for the windows when it gets nice outside. Open or closed fits right into my recent post about that very subject. When I grew up, we had one window AC unit, but I have to say that although I use it as little as possible, AC is a blessing in the hot, humid Midwest, particularly when bedrooms are on the second floor and there’s not good cross breeze. We flip the AC switch to on when company knocks at the door. I’m from the sultry south so, with a fan or two on the worst days, New England feels air-conditioned to me. Just beautiful! I have a soft heart for colonial style houses like this. We built ours in the same style – with shutters and paned windows. Nothing as fancy as this, though, with the inviting porch and extra look out window on the roof. I’d love that centered second story porch. I’d decorate it for Halloween with a family of partying skeletons and spooky lighting! I could get used to that house! 🙂 I too love my A/C. I lived in a house that looked exactly like that, but probably smaller. Including the glassed in porch, but the upper story was a balcony rather than a room. The house was painted the same colors, too. Your house is probably older. Ours dated to 1928. It was a very good house. What a wonderful home, and the glassed in porch would be a bonus. I love the red geraniums in the front, just adds a lovely bit of colour. We need heating and air-conditioning in Canberra, and when we first came here (in our 30s) we were pretty tough and hardly ever used the air-con…now we use both…no going back on that one! Yes, I think once you have become accustomed to the even temperature and lack of humidity inside it is hard to go back. I can wade through it outside and just keep wiping the sweat away, but once I come inside, well, I like it a little cooler. “On and humming” — oh, yes! Especially in such summers as we’re having now. I just happen to be partial to red geraniums, and I can’t think of a worthier border leading up to that splendid door. What stately history. Thank you! 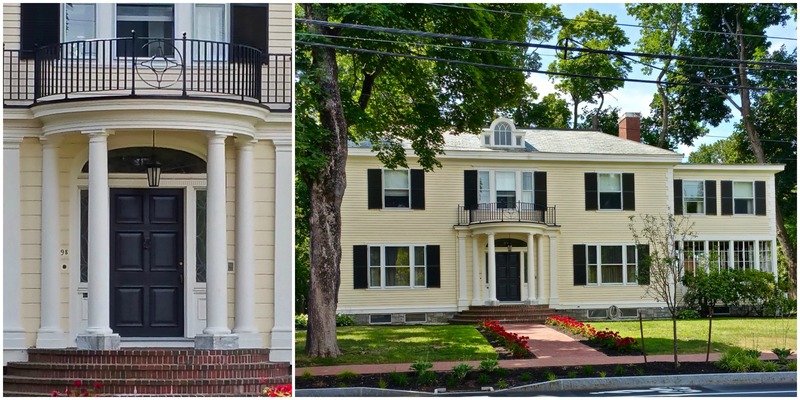 There are so many beautiful homes in New Hampshire and that certainly is one of them. When we first moved to New Hampshire we rented a home for one year without A/C. Luckily that year we only had one heatwave. After that, each home including our cottage on the lake in Maine had A/C and on many a summer day I was thankful. Now that’s an observant eye that you have there as I’d have never thought about the windows and A/C ! My favorite kind is of a particular tint of color, Judy. Simply gorgeous, including the red geraniums border! I remember living in Michigan with disgusting heat and humidity and no AC. I hated it. I do love having all the windows open if the temperature is right but otherwise give me my AC! I love my A/C, but lived the first 21 years of my life in South Florida without any in our home!